In the original Oculus Rift shipment, you get two Oculus Sensors. This basic setup will be enough for seated play, but not really sufficient if you want to enjoy standing 360° gameplay or room-scale VR. 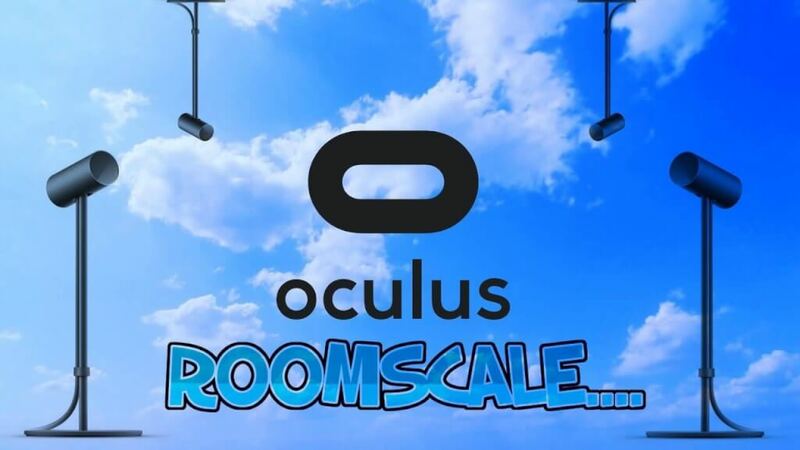 At Oculus they quickly realized that in order to compete with HTC Vive, room-scale VR is mandatory. For this very reason, not long after the initial release of the Rift, standalone Oculus Sensor is available for purchase. Simply put, you will need to buy at least one additional sensor in order to enjoy room scale virtual-reality. This means there are three options – 2, 3 or 4 sensor setups. Two Oculus Rift Sensor setup works most of the time only if you are playing in a seated or stationary position. It can actually work very well with games such as Robo Recall. You will have a visual reminder to re-orientate yourself in cases you turn around while playing. 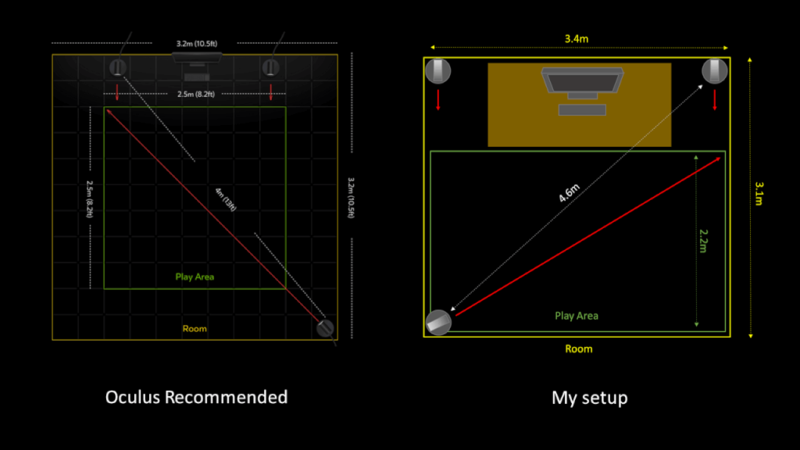 So, the conclusion is, with only two sensors you can’t really enjoy standing 360° play. The problem occurs when you turn away from the Oculus Sensors, and at these times tracking won’t work properly. While you are facing the sensors, the tracking is perfect for the most part. Unfortunately, this is as far as you can go with the 2 Oculus Rift Sensor setup. To be completely honest, room-scale is technically possible even with this setup, but it doesn’t really work as intended, so it may become a frustrating experience. You will quickly stumble upon the “blind spots” which won’t track the Touch controllers. Be it as it may, the 2 Oculus Rift Sensor setup still provides an unparalleled experience compared to those you get when using Google Cardboard or Gear VR. With the 3 Oculus Rift Sensor setup, you can play 95% of the games with pin-point perfect tracking. You can only encounter issues when you are at the edges of your dedicated play space or facing a corner in which you do not have a sensor placed. Three Oculus Rift sensors may be unable to track Touch controllers in situations when you position them very close to your body. However, you can easily deal with this in most cases by simply turning around in real life. To cover some technical details, Oculus Sensors won’t track objects past 10 feet. The sensors’ field of view is 100° horizontal and 75° vertical. 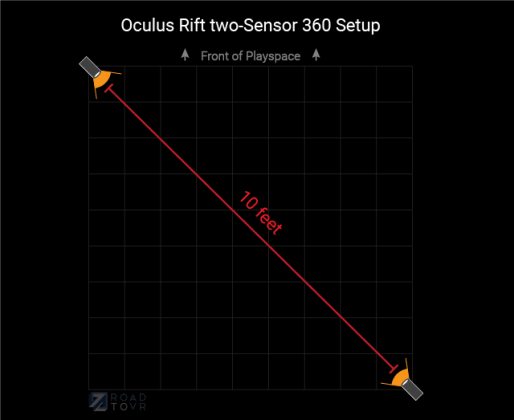 The image below explains how Oculus Sensor perceives the space. You should have this in mind when placing your sensors around the room. User experience suggests that mounting sensors to the walls or the ceiling provides the best tracking. If you are unable to do so, look for high shelves or other surfaces around your VR room, since you want to elevate the Rift sensors off the ground as much as possible. Eventually, in order to set up a perfect VR room, you are going to have to invest not only in additional Oculus Sensors, but some cables, wall mounts or tripods too. For that reason, make sure to check out VRBorg’s list of best Oculus Rift cable extensions! If all those cables start getting in the way, especially the extended HMD cable, you should also check out the Rift HMD cable management tips & tricks! 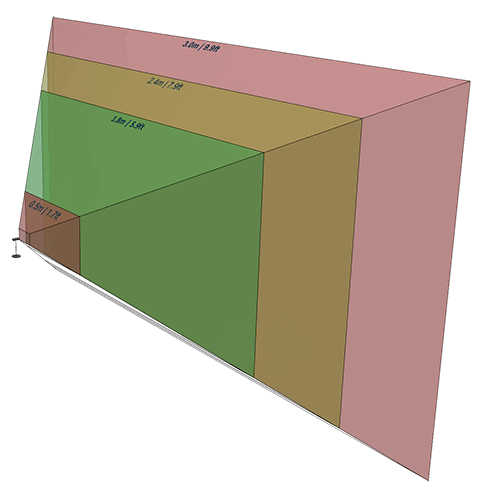 While the 3 Oculus Sensor setup is sufficient for the most part, we are aware there are many enthusiasts among our readers which are willing to experiment and improve their virtual playground even further. If someone asks you, hey, why you getting that fourth Oculus Sensor when it can work just as well with 3? While definitely not necessary, it really smooths out the tracking. You will be able to expand your dedicated virtual playground to the 3×5 meters area. It is probably a good idea to think ahead before purchasing the fourth sensor and extend the HMD cable so you can cover the required area. Most of the time, 3 Oculus Sensor setup will work fantastically. However, if you decide on buying the fourth one, you will take care of the Oculus Rift Sensor tracking issues forever, since you will never again encounter any! More space and better tracking? Get the fourth and final one & you are done! Previous articleWhat are The Best VR Controllers for iPhone? Next articleIs Oculus Go Worth It?